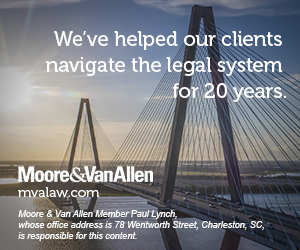 We are proud to have served the Charleston community for 20 years and appreciate our clients, lawyers and employees for making this significant milestone possible. For the past two decades, individuals and businesses who call the Lowcountry of South Carolina their home have entrusted and relied upon Moore & Van Allen to offer sophisticated legal advice across a wide range of legal issues including, but not limited to: wealth management, real estate, litigation, environmental, bankruptcy and collections, commercial finance transactions, construction, regulatory compliance, economic development, securities, private equity, mergers & acquisitions, corporate transactions, finance, technology, healthcare, manufacturing and beyond. This breadth and depth of knowledge allows us to serve our clients and to address the complex legal and business challenges they encounter. Our commitment to the Lowcountry is also reflected through our philanthropic efforts. In addition to providing financial support, the Charleston office is committed to partnering with local nonprofit organizations to offer charitable, bar, civic and pro bono service. We look forward to continuing these partnerships for years to come.